While the Arab world has been and is still revolting against its dictators, the situation in Lebanon is a bit different and more complex. According to activists Imad Bazzi and Ali Fakhry, the Lebanese people are suffering from 128 dictators, who make up the Lebanese Parliament, and a sectarian regime. They both decided on the 16th of February to practice their right as Lebanese citizens and speak out loud against this situation. Here's how it went and how the Lebanese on line community reacted to this move. 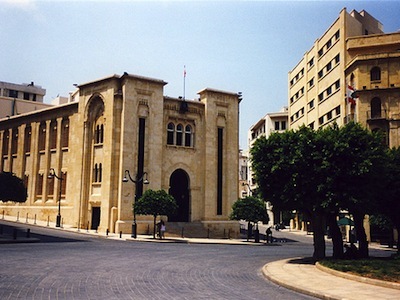 The Lebanese parliament building in downtown Beirut. Image by Flickr user nathanm (CC BY-NC-SA 2.0). Here's a question, whose fault is it? Is there a need to analyse what was done and who did it? Isn't it obvious? Isn't it the Lebanese political layer of rich warlords and those who trade in blood who are behind what plagued the country from 1975 till today? Aren't they the same people who took our rights, either by money or threatening any democratic movement? On the 16th of February, Imad, who describes himself as a full time blogger, and his activist friend Ali Fakhry decided to announce their rejection to the sectarian regime by sneaking into the Parliament building in down town Beirut and holding two banners which read: “Egypt had one dictator, we have 128″ and “The people want the sectarian regime down” in Arabic. In no time they were faced by the police who threatened them, ripped their banners off and deleted the images on a digital camera they had with them. The Lebanese twitosphere's reaction was torn between supporting and making fun of what they called a foolish stunt that was more entertaining than useful. @LebaneseVoices: #feb16 didn't need to be a big-bang but it showed the metal of many. those that rant about change but really never care enough to try. @FadyRoumieh: For all those considering burning themselves in Martyr Square today – Think again. It's Raining, u will NOT, I repeat, will NOT catch fire! What would it take for the Lebanese people to revolt? You can check the hashtag #UniteLB on Twitter for examples of what today's Lebanese people want.